All those fantasies about a “brokered convention” have long since gone by the wayside. But some people still have fantasies about a Clinton-Sanders ticket, or a Trump-Rubio ticket. And that led to this week’s trivia question: Since 1972, when the primaries began to decide the presidential nominee, what ticket was comprised of two candidates who stayed in the race against each other the longest? Last week’s trivia question was … Who was the last major-party presidential candidate who had the most delegates going into the convention but failed to win the nomination? The answer? 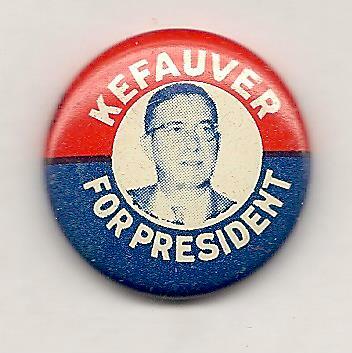 Estes Kefauver. The Tennessee senator led going into the 1952 Democratic convention in Chicago and had the most delegates on the first two ballots. But then there was a stampede towards Illinois Gov. Adlai Stevenson, who won the nomination after the third ballot. The randomly-selected winner is Joanie MacPhee of Athol, Mass. Joanie wins the coveted Political Junkie button.